The island of the Gods, Bali is devoted to spirituality, with colourful Hindu ceremonies, purple sunsets, tranquil shores and foreboding stone dragons, covered with moss, but ever vigilant. Despite their extrovert festivals, Balinese people are actually very passive and friendly to international guests. Kutti is Bali’s most popular tourist hotspot, with its famous beach offering iconic sun rises, world class surfing and beachside restaurants luxury resorts. Even Australian surfers seem to opt for Balinese surf over the waves Down under, testament to how extraordinary its waters are. To the south is Legian, with a more relaxed, secluded feel and similarly magnificent landscapes and tropical shorelines. In the evenings, fire spinners weave red flames and form majestic silhouettes in enchanting moonlight. Rustic markets in Legian offer traditional cuisine and charming Balinese wares to curious tourists. Locals in Legian are some of the friendliest in Bali and invite tourists to their nightly football matches on Blue Ocean beach. Seminyak, in western Bali, is a unique combination of the ancient and the modern, where visually intense ceremonies provide commune with the gods, whilst modern shopping boutiques and invigorating health spas are a luxurious taste of the present. Uluwatu Temple perches on top of a cliff, approximately 250 feet above the waters of the Indian Ocean, looking down onto the crashing waves. 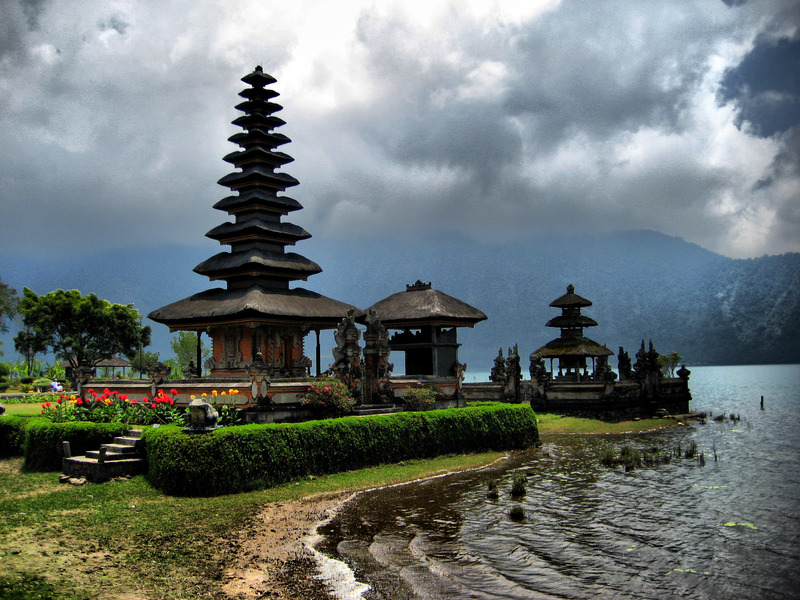 It is this setting that makes the temple one of the most popular in Bali. It takes an hour to climb the temples narrow, snaking cliff path, but the mind blowing views alone are worth it. Upon reaching the end of the path visitors are treated to fantastic examples of Balinese architecture and ancient gateways and sculptures. Open every day, this is an exciting, open air, adventure activity amongst the tree tops. The Bali Treetop Adventure Park has more than 70 different activities and adventures for all ages and fitness levels. Zip wires, suspended bridges, Tarzan Jumps and flying swings are just a few of the challenges guaranteed to get your pulse racing as you join the birds and make your way through the tree tops by whichever method is available, as many times as you want. Possibly Bali’s most famous beach, Kuta Beach is 5 km of clean, pure white sand stretching along the Indian Ocean, a popular tourist destination for bathers and surfers alike. It isn’t difficult to understand why; by day the water looks turquoise against the whiter than white sand but with minimum light pollution over the ocean the scene really comes to life at sunset or sunrise. The colours from the Sun are reflected in the ocean, blending them together in a continuous light show of colour. This budget hotel rests on a peaceful side street in Seminyak. Despite being located away from the main drag of the town, Gusti Homestay is still one of the most popular budget accommodations available. Airport transfers are included and bicycles are available to hire from the hostel. Modern, clean and comfortable, this hostel has plenty of cool common areas to relax in, making it perfect for social living. All rooms have a private bathroom, Wi-Fi and breakfast are included, and there is also an onsite restaurant, bar and laundry service. The atmosphere is warm and welcoming with friendly staff who are happy to suggest (and book) excursions for your stay. Echoland Bed and Breakfast is abrand new, purpose built, budget accommodation located in Canggu on Kuta. Metres away from the renowned Echo Beach, this bed and breakfast is designed to meet modern travellers needs without spoiling the natural atmosphere of the area. Amenities include free Wi-Fi, a swimming pool and an inclusive breakfast with an additional laundry service available. The dorms are basic at this hostel, but have very clean and comfortable beds – something that travellers quickly come to prize above all else. With the relatively undeveloped echo beach as the main nearby attraction the hostel has a relaxed atmosphere and friendly but professional staff.